Cache is in the Great Swamp. Its a very flat and easy hike in. No pets are allowed in the park. Park at the Lord Stirling Park's Environmental Education Center, on Lord Stirling Rd. Because it is in the swamp, the route can be quite wet in April and May, or after particularly rainy periods, but most of the time the walk is dry and pleasant. Start at the trail behind the Environmental Education Center. The flat trails make the walk an extremely easy one, but the flora and fauna in the area are varied and plentiful, making it an interesting walk for nature lovers. Watch out for ticks in season and birders, be sure to bring your binoculars. Several trails lead to the cache site. At times they turn in the wrong direction, but they eventually head to the area of the cache. Please resist the urge to bushwack and stay on the trail until you reach the cache site. > Among the contents are a biography of Lord Stirling. Read it, but please leave it in the cache. The Evironmental Education Center is an interesting side trip. There is a well stocked library devoted to environmental issues. as well as a very interesting display on the geological and human history of the Great Swamp in the basement. The Great Swamp is one of the remanants of Lake Passaic, which was a 30 mile long, 10 mile wide lake that once covered this area. 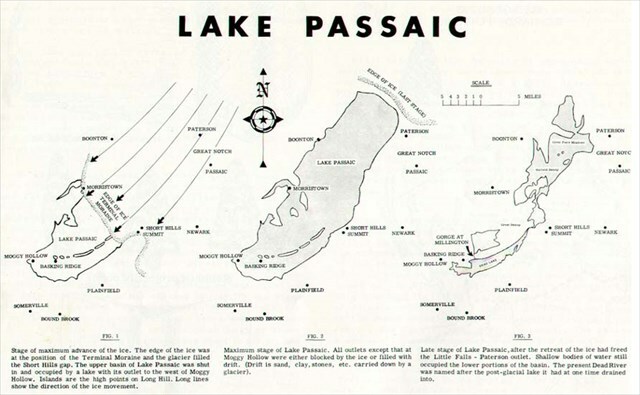 For more information about Lake Passaic, see my Bottom of Lake Passaic series of caches: BOLP III ,BOLP II ,BOLP I, or click on the link to the the map of Ancient Lake Passaic below. Ybbx vafvqr n ynetr ubyybj ybt.